By late afternoon on May 17th, it was clear that the Germans had conquered the whole of Zeeland apart from Zeeuws-Vlaanderen. The battle around the Sloedam was still raging, but Dutch units in western Walcheren were inquiring at the Dutch staff office whether or not capitulation was feasible. When many local commanders failed to reach the staff — which was indeed hard to do, especially due to the ongoing bombardment of Middelburg — local capitulation initiatives soon developed. 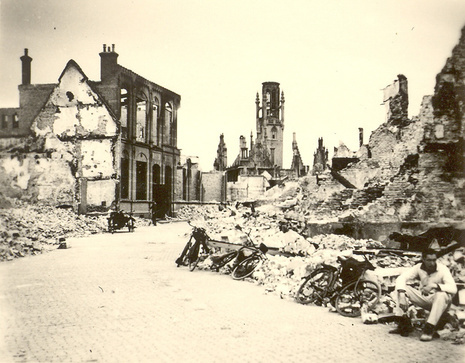 Van der Stad was repeatedly queried by his officers and the mayor of Middelburg about when the capitulation of Walcheren would be offered to the Germans. He made it perfectly clear that this could never be the case as long as French troops were still fighting the Germans. 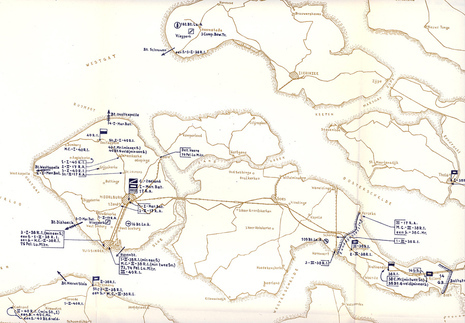 Late in the evening, a radio transmission was broadcast stating that Dutch forces in Walcheren and Zuid-Beveland would surrender. Half an hour later, Lieutenant-Colonel Karel himself went to the road east of Middelburg along which German troops were heading southwards. He was transported to a hotel near Vlissingen, close to the sluices, where he officially informed SS Standartenführer Steiner, commander of the SS Regiment, of the capitulation of the Dutch forces on Walcheren and Zuid-Beveland. Noord-Beveland was officially not part of the armistice, but on the morning of the 18th a German officer was sent over under a flag of truce, he brought the news of the Dutch surrender elsewhere. Upon this news the Dutch forces — isolated from all the rest — surrendered as well.